The master bedroom is equipped with a queen-sized bed, spacious en suite bathroom and walk-in closet. There is also a queen-sized bed in the second bedroom, two bunk beds in the third bedroom and a double pullout sofa in the living room. The second bathroom located between the 2nd and 3rd bedrooms is equipped with a shower-bathtub combo. This home sleeps up to 10 guests very comfortably. For families traveling with small children there is a pack and play crib available. In the large living area you'll find a 6-person dining table, large flatscreen TV with cable, games, books and music for the whole family, free high-speed WiFi and a laptop friendly workspace. The wood burning stove keeps the house toasty on chilly nights and lots of dry split wood and fire starters are provided. The open chef's kitchen and bar has been stocked with high-end deluxe appliances ranging from a juicer to a waffle iron to allow you to prepare absolutely anything you may wish during your stay. There is also a covered dining area to the front of the house, a 5-burner gas BBQ grill and a small sun deck in the private (fenced) backyard. 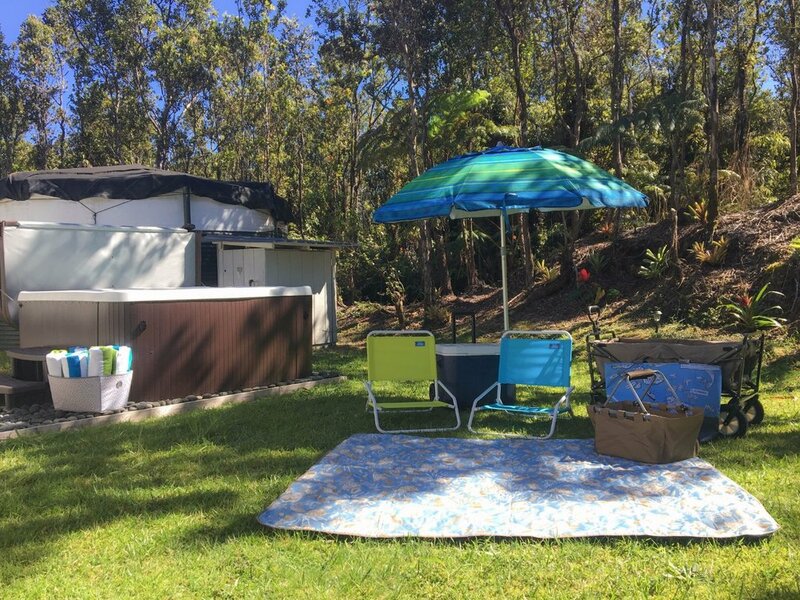 Beach mats, towels, coolers, an umbrella, picnic basket and small collapsible wagon make trips to beach easy and fun, while the mens and womens right-handed golf clubs can be used at the Volcano Golf Course and Country Club, just a 15 minute drive away. 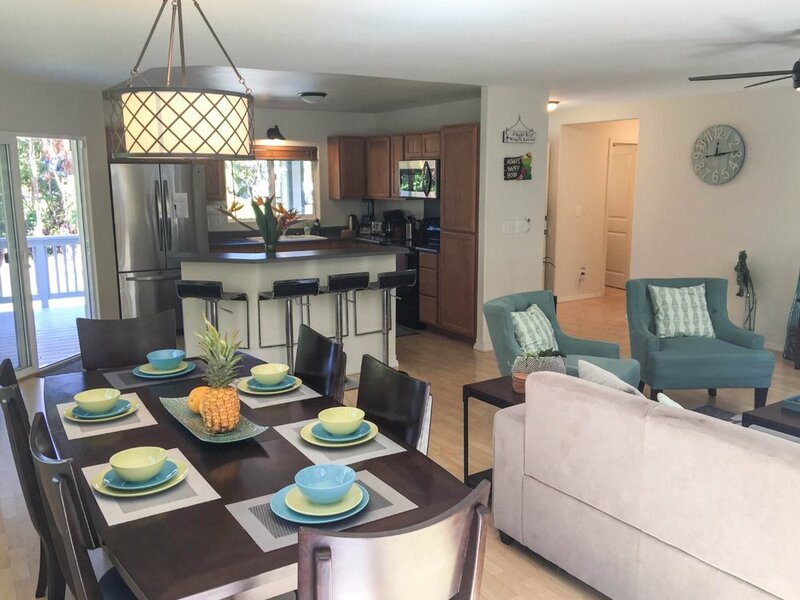 This lovely home nestled in the lush Hawaiian rainforest, on a quiet street just a few miles from Hawaii Volcanoes National Park and Volcano Village. Perfect for families, groups of friends or even couples looking for a private oasis and lots of extra space! Rooms: 3BD/2BA One queen sized bed in master bedroom with en suite bathroom, one queen in second bedroom and two twin bunk beds (sleeps 4) in third bedroom. Fold out double sofa in living room. Complimentary: Complimentary coffee, tea, creamer and sugar.Starter supply of paper products. Amenities: HOT TUB, Free highspeed WiFi, deluxe chef’s kitchen (Ninja Kitchen system, blender, food processor, Jack Lalanne juicer, crock pot, rice cooker, toaster, waffle iron, electric griddle, turkey roasting pan, casserole dishes, wine decanter, spice rack, electric kettle, hand mixer, everything needed for baking), 5 burner gas BBQ grill, wood burning stove, men's and women's right handed golf clubs, luggage racks, hair dryers, iron and ironing board, pack and play, cooler, beach chairs, beach umbrella , beach towels, waterproof picnic/beach blankets, picnic basket, collapsible wagon blu-ray player and movies, board games, free US local and long distance (no international calls).